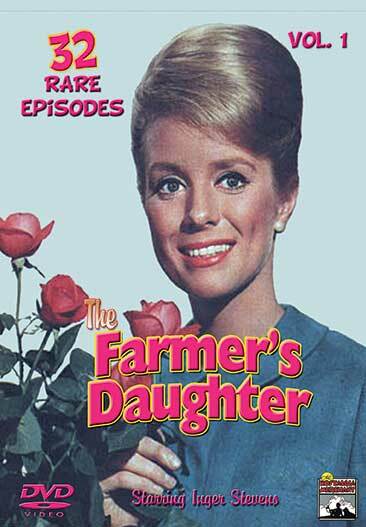 The Farmer’s Daughter TV Series starred Inger Stevens as Katy Holstrum, a young Minnesota woman who becomes the housekeeper for widowed Congressman Glen Morley (played by William Windom). Glen also had two sons, Steve, age 14 , played by Mickey Sholdar, and Danny, age 8, played by Rory O’Brien. Cathleen Nesbitt played the Congressman’s mother, Agatha Morley. It aired on ABC from September 20,1963 to April 22, 1966. This is a very nice collection of 64 episodes. It includes 16 DVDs, custom labeled and packaged as seen here. The best available assets have be used in this collection. Video and audio Digitally remastered. Quality rating is 8.5 – 10. VHS and Film transfers. Volume 2: Another Country Heard From, Follow The Leader, The Nesting Instinct, Katy by Moonlight, Exit Katy, Rich Man; Poor Man, Crime of Passion, Why Don’t They Ever Pick Me?, Katy’s New Job, Katy’s Campaign, The Woman Behind The Man, Katy The Diplomat, Katy’s Castle, Never Listen to Rumors, Ja, Ja, a Thousand Times, Ja, Nej, Nej, a Thousand Times, Nej, The Hottest Ticket in Town, Stag At Bay, Sleeping Beauty Revisited, Forever Is A Cast Iron Mess, Powder Puff Invasion, To Have And to Hold, Crisis At Crystal Springs, A Sonny Honeymoon, High Fashion, The Platinum Swizzle Stick, Steve; Boy Lovelorn, A Jewel Beyond Compare, Katy In A Capsule, Alias Katy Morley, Anyone For Swindling?, Is He or Isn’t He?